We were at Walmart last night and this is what we saw. 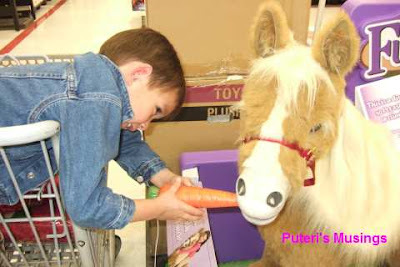 A pony that can "chew" on a carrot. It can also move its head, swish its tail and neighs and snorts when patted! It thrilled Duncan so much that he wanted me to buy it for him! 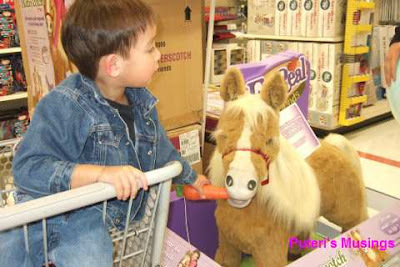 Haha, it costs a couple of hundred dollars, and of course I will never spend that kind of money on a toy pony! So I told him, "Ask you Nana. Maybe she'll buy you one." Haha. My God toys are so expensive nowadays. I wont be able to buy any toy for my grandchildren if all that they want is a toy that cost 'a couple of hundred dollars!'. When our own kids were young, we would allow our children to browse at all the toys in the store only if they promise to request one that will not cost more than RM3 at the end of the hours of oggling and touching the more expensive ones. They will only end up with buying the matchbox model of cars. WIN win situation for both parents and kids hahahaha. (Note the small letters for the second win). I guess not much of a toy can be bought for that amount of money nowadays. Yes, the good toys are expensive. Good thing there are still those cheap Made in China toys that we let our children pick out every now and then from the dollar stores! Heheh. No, not much can be bought with RM3 nowadays. I don't mind getting those used toys from the thrift stores for my kids. I will never buy those toys for them at full price because I know they will only play with the toys for a while before they get tired of them. For a few dollars you can get some really nice toys from the thrift store. New or not, my kids don't care, as long as they can play with them! Win-win situation here to, eh! Cant blame him, the pony is so cute, he has good taste. Yes, he sure has good taste! Sigi iya, Pat. Parents mampu, so untung lah bala anak. Anak nadai mayoh ulih meli expensive toys.